Just a few months ago, I stood at the Kotel, leyned from Torah and together with Rabbi Gersh Lazarow, led a Mincha Shabbat service as we celebrated the bat mitzvah of one of our Australian community members. My first visit to the current Egalitarian prayer space at the Kotel was uplifting, it was one of the first moments where I felt a connection between my own religious practices and Israel. It brought me hope that Israel’s government and its people would continue to learn and embrace the many ways to be Jewish. Last week, I arrived in Jerusalem for a year of study at the Hebrew Union College – Jewish Institute of Religion – to immerse myself in the complexities of Israeli language, history, culture, religious practices and politics – and to continue developing as a Jewish educator, prayer leader and leader of community. As I prepared to leave Australia, I was disheartened to hear of the Israeli Governments decisions regarding conversion and the Kotel agreement. Over the last week in Israel, my friends, fellow students and our rabbis and teachers, have discussed extensively these decisions, as well as the values of leadership, the diversity of the Jewish community and the need to treat each other with respect. On Shabbat, Rabbi Haim Shalom, from HUC-JIR reminded us that we are not fighting about ancient stones, but rather our right to publically practice our Judaism at shared religious sites in the same ways we do in our synagogues and homes in Israel, and for many of us as members of the diaspora, as we do around the world. On Saturday evening, I attended the Havdalah and rally outside the Prime Minister’s residence. A small stage was set up on the street, with a podium, instruments and the words in the background “There is more than one way to be a Jew.” What began as a small gathering of individuals and groups, very quickly grew into well over 500 (if not closer to 1000) of our Progressive, Reform and Conservative friends joining together, for a calm and respectful reminder to the Israeli government of our right to be treated equally as Jews in the State of Israel. Representatives from Women of the Wall, the Union for Reform Judaism, Hebrew Union College, Netzer and many other groups joined together in song, sharing ruach and hope inspired by our liturgy and tradition, before continuing into Havdallah. This was followed by more communal singing and words from community group leaders, including Anat Hoffman (Women of the Wall), regarding our dedication to these causes, ensuring that we will not give up. 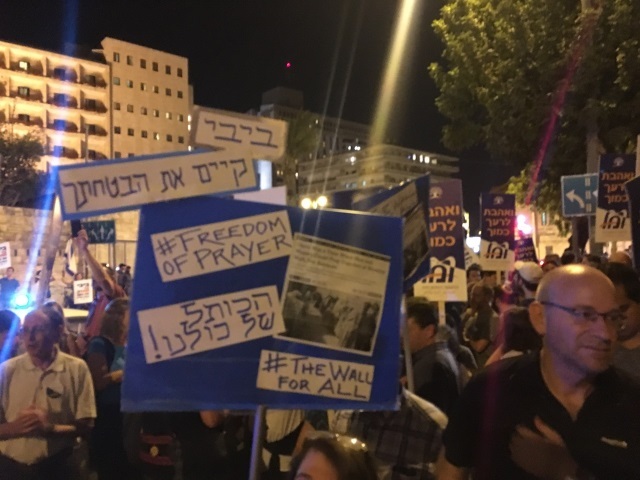 The vibe at the rally was electric, and although mostly in Hebrew, it was clear that we were all there for a shared love of our movements, religious diversity and our desire to connect and develop our religious practices with the State of Israel. 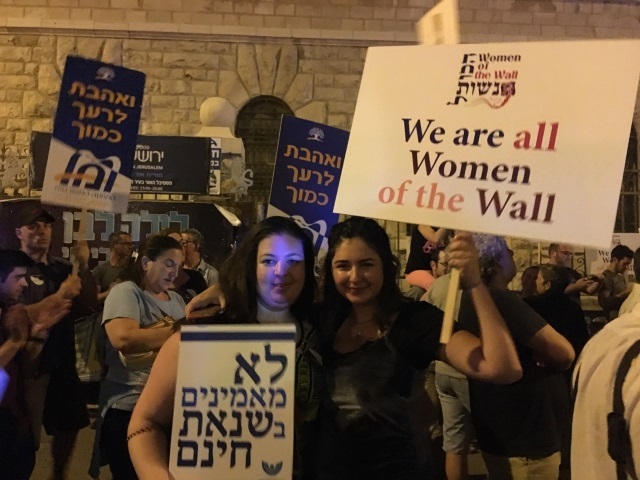 Organisations handed out posters, banners and t-shirts, loudly proclaiming: “Love your neighbour as yourself,” “Bibi, I am Jewish too,” and “We are all Women of the Wall.” Individuals shared rosemary and plastic torches so we could all participate in Havdallah. As the gathering grew, more and more of the road was blocked off, as we were safely watched over by police and security. It was difficult to see just how many people were there, but we could all feel our ruach. The rally concluded with a thank you (in English) to the many present who represent the diaspora’s support on these issues, before we joined in our song of hope, Hatikvah. The support of the diaspora has been felt throughout Israel, as organisations and synagogues have responded not just with words, but also with action, encouraging others around the world to speak up and remind the Israeli government that they must treat us with the respect our movements deserve. It has taken a few days to settle into my new home here in Israel as I again search for that connection to Jerusalem and Israel that I felt at the Kotel only a few months ago. My spirits are lifted by being surrounded by passionate future leaders of the Progressive and Reform movements and the sense of comfort and unity that was present at the rally. I am hopeful that the government will quickly readdress these issues and continue to develop and respect the diversity of the Jewish people, by leading a country that honours the practices and needs of each of our movements equally. Until then, we must continue to do what we always do – and as we did on Saturday night – to join together in song, speech and spirit, to show up, to speak out and to make sure we are heard.